Philadelphia is known for a lot of great things: the birthplace of America, the home of the first zoo, Bradley Cooper and delicious food. 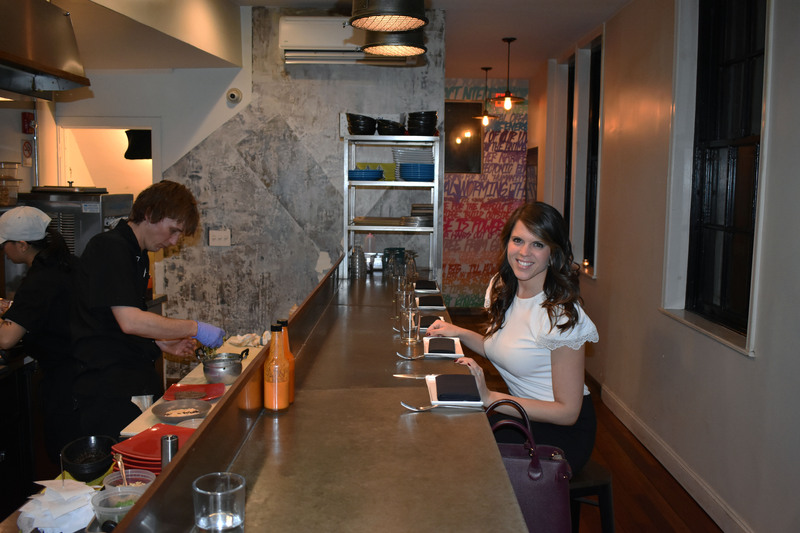 In the past four years, I’ve had the opportunity to dine at some of the best restaurants Philly has to offer. Now, I’m no restaurant critic, and I’m not big on red meat pork or cheese, but like you, my loyal readers, I’m a huge fan of healthy eating. There’s no shortage of fabulous places to eat in downtown Philadelphia. When talking to friends and family back home, my husband always quips that we’ve never been to a bad restaurant in the city. And when I find restaurants that we absolutely love…we cannot stay away! That brings me to my three places that I just can’t get enough of and where I can be frequently found for lunch or dinner: V Street, Wiz Kid and Vedge. V Street: Probably my favorite of the three. I love sitting at the chef’s counter (Brandon pictured above, is a MASTER in the kitchen) with my husband during the week and watching the magic happen up close and personal. My go-to dishes are the Beet Lángos, Carrot Asado, Cauliflower 65 and the Dan Dan Noodles. For those that have a sweet tooth, they have a daily soft serve that is incredible. And did I mention its vegan! An added bonus of V Street is its home to one of my all-time favorite servers: Ashley. Ashley is great and I highly recommend that you ask for her when you go. Vedge: If you’re looking for a fancier dinner spot, look no further. Their focus here is locally sources vegetables and creative spices and sauces make Vedge a must. I’m not a huge fan of radishes, but their fancy radish dish is superb and a favorite of my husbands. Another favorite of mine is their fingerling potatoes – lightly roasted and drizzled in a “to die for” sauce. You truly cannot go wrong with any selection of their menu. I suggest trying everything. They are designed to be shared! Each restaurant has its own unique look and cuisine; however, there are some subtle similarities you see between them as well. For one, they are all vegan restaurants. Who needs cheese sauce when you have rutabaga sauce? Also, these are healthier restaurants that focus on portion size. If you’re looking for big portions, these restaurants are not for you. But, if you’re looking for a light meal with amazing flavors, then look no further than V Street, Wiz Kid and Vedge. You cannot go wrong with either of these choices! They source local and their menus are always changing. Be sure to keep an eye out on their social media for menu updates. I promise you won’t be disappointed. This Spring, they are expanding to Washington D.C. with the Fancy Radish. Watch out for official grand opening details. I am personally excited and cannot wait to see their success in DC! If you have dined at any of these restaurants listed above, tell me what’s your favorite dish. And or if you haven’t yet, book a reservation and tell me about your experience!